Wishing each of you a healthy, happy and prosperous New Year. The 2010 Schedule as seen in the recent January/February edition of Vintage Motorsport is below. We are still working through the decision/negotiations about GP du Canada 11-13 June. Thank you for your patience. 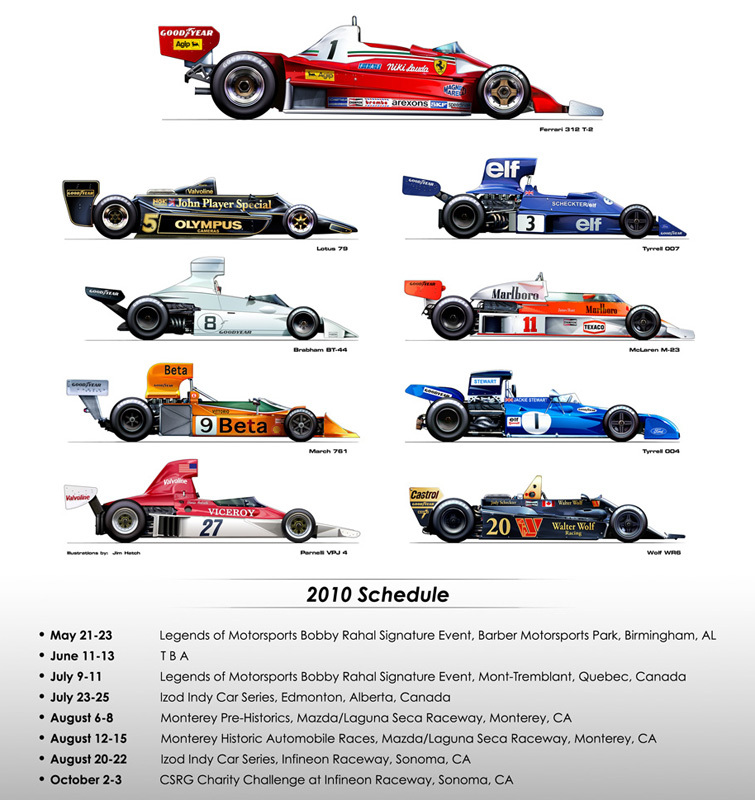 Please note that for the first time in almost a decade the full 1966-1983 three liter F1 era will be welcome at the Monterey Historic Races. Their Entry Deadline is 31st January, so please complete your forms ASAP. They are anticipating a full 30 car grid as we had last in 2001. Rebecca e-mailed entry forms to everyone in early December. If you did not receive yours, please contact Rebecca@historicgrandprix.com and she will get one out to you via e-mail. We are pleased to confirm that we have entered into an agreement with Bobby Rahal, Peter Stoneberg + Zak Brown to support their new enterprise, Historic Motorsports Productions LLC. HGP Members automatically become members of Historic Motorsport Productions with the payment of the HGP Annual Dues of $1500. You will need to complete the HMP membership form and return to their office. For those of you anxious to make your hotel reservations for this season, we can confirm we will have host hotels at the following events: Birmingham, Montreal (if a deal is finalized), and Mt. Tremblant. These have been increased to accommodate the majority of the HMP portion and are now $1500, payable by 15th February please. We are again working with the major transporters in an effort to package 6 or more cars at an attractive rate for the three eastern races. Please contact us for details and with your interest. There is a resurgent level of activity in earlier cars and we want to provide them with appropriate recognition. Trophies will be awarded to both classes at HGP events. In 2011, we will return in Lime Rock Park on Memorial Day weekend. It is planned that subject to sufficient cars in the 1966-1973 class a separate race will be held for this group. Looking forward to seeing you at the races.